Just a little scatterbrain post today. June is a packed month for us with lots of family events, our respective jobs and just regular old life. I haven't gotten much down time to work on projects or sit down to create something fun. It makes me very antsy but I expect our social calendar to empty out soon which will leave time for more creative endeavors. Yea. No surprise - I'm obsessed with deep blues! Read my take on three different ways to dive into deep blue at MyColortopia. This hex wall treatment (and the entire room for that matter) is one of the most clever kid's rooms I've ever seen. Well done Vintage Revivals! So there you have what is on my scattered mind right now.  For lots more like Brooklyn Limestone on facebook, follow Mrs. Limestone on pinterest and twitter. I hear ya! What's the deal with June, anyway? We're packed with family events (not complaining, of course) and I too am looking forward to some peace n quiet in July. I also painted my son's room a blue shade somewhere between the navy and the slate you have here. I love it! It's cozy and warm and great for a boy's room. did you see HGTV design star yesterday? Well Brooks did one of those light fixtures on his Rock Star room....so similiar....love that honeycomb wall too! I haven't been watching this season. Maybe they will rerun the episodes so I can catch up? wow that table is really gorgeous! and i've been thinking/dreaming of doing navy blue in our living room but i've been too nervous to take the plunge! Those bulb lights are amazing. Can you imagine rigging that up for an outdoor dinner party?? God I love that 1st image! I would kill to be a guest at that dinner party. Amazing!! That table is insane. Do you think people actually go to events with tables like that or are they just styled for photoshoots? Im guessing this one is just for a photoshoot but Im sure there are pretty amazing wedding/dinner party decor set ups we never see. Yes. These light bulbs are my ultimate. That's probably why I'm obsessed with the firefly pendants from CB2. Mandi from Vintage Revivals is a visionary. Her work is amazing. 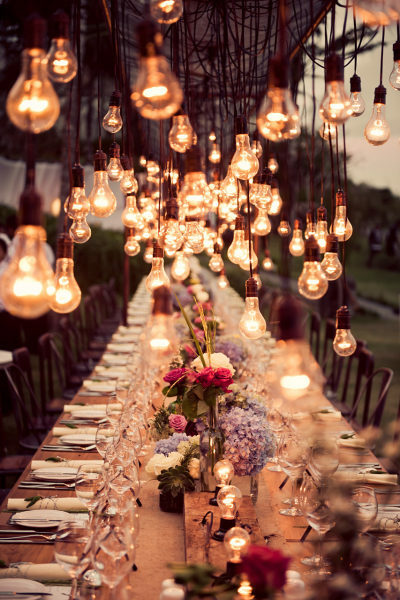 I can't get over how much I love the bare bulb fixtures over the table, it has amazing ambiance!